DK Pass is the first course of the Star Cup in Mario Kart DS and the second of the Leaf Cup in Mario Kart 7. As its name implies, the course is owned by Donkey Kong even though no characters from the Donkey Kong series appear in it. The stage takes the player over a mountain and back down. Numerous snowballs roll around, and racers lose their item and spin backward if they crash into one. Snowmen also appear in the course, similar to the ones in Frappe Snowland in Mario Kart 64. Collision with them has an identical effect as crashing into a snowball. An isolated Item Box appears up on a snowy cliff at the peak of the hill, after the second set of normal item boxes. To avoid drag, the player will need a Mushroom or two to get through the snow to the item box, but in it contains one of these items: Star, Mushroom, Triple Mushroom, or a Red Shell. Any of them can be received in any position, including in Wi-Fi play, but it will usually yield Triple Mushrooms or a Star. There are two missions involving this circuit: 4-1 and 5-7. In mission 4-1 the player must reach the finish line before DK and in mission 5-7 they must go through the eight gates in order. Both involve the player going in the opposite direction. The staff ghost in this track is 2:14:607 using DK in the Wildlife. 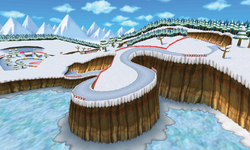 DK Pass returns as the second track in the Leaf Cup in Mario Kart 7. All the trees in the off-road sections have been removed and some wooden ramps have been placed in the off-road area of this track, allowing players to perform a trick and gain a boost. After turn 11, the boost pad in the large jump is replaced with a gliding pad. Landing outside the barriers will result in an "out-of-bounds". The secret item box on the hill still holds a Mushroom, Triple Mushroom, or a Star, but will more often yield only a Mushroom than before, and no longer yields a Red Shell. The trees on the hill are no longer there. Much like DK Summit, the track starts out foggy in the first two laps, but the fog clears up on the final lap. It is also now snowing throughout the race, which did not happen in the original. Every fictional sponsor in DK Pass is displayed on a trackside banner. "Covered with snow and ice, DK Pass is as dangerous as it gets. Tight turns and runaway snowballs make for nail-biting fun on DK's home turf." "Brr, it's chilly in them thar hills... Pack your winter woollies through for this sub-zero speed through snow-capped peaks, as you dodge rolling snowballs and negotiate rows of rock-solid snowmen that bring your kart to an abrupt halt. Keep moving or your engine might freeze up..."